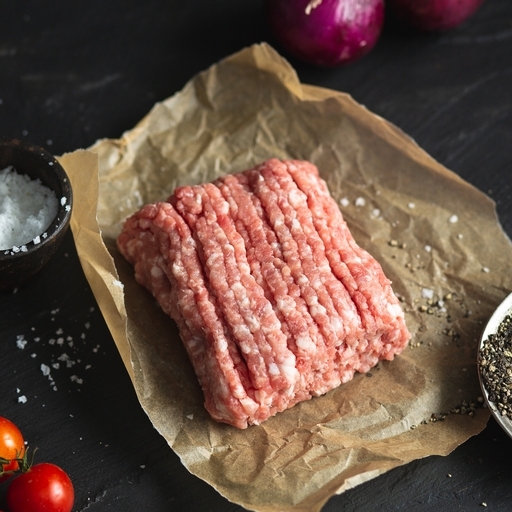 Lean, full-flavoured organic pork mince prepared in the Riverford butchery, using prime quality meat (not scraps!) from grass-reared Wiltshire pork. An underrated cut, but it makes fantastic meatballs, burgers and pasta sauces, as well as tasty homemade pâte and scotch eggs. Serves 4. Perfect for making into burgers, koftas or meatballs, for a speedy cook in a pan, under the grill or on a BBQ. Use it in your ideal sausage roll filling, stuffing or coarse pâté. Or cook slowly into a ragù, chilli or pie filling. Brown well for the first 5 mins of cooking; it deepens and intensifies the flavour. Cook thoroughly before eating.